This summer, the Our Lady of Lourdes Youth Ministry will be participating in a Catholic Heart Work Camp. For those unfamiliar with the concept, work camps are a week of service where we set aside time to help those in need, surrounded by other youth in an environment of both faith and fun. During work camp you will spend your days helping out at a ministry site and your evenings are spent hanging out playing games with the other youth as well as spending time at mass and in prayer. If you are interested in participating in this year's work camp, please see all the information below and let me know of your interest as soon as possible! Spots for the work camp are filling up fast! I hope you will seriously consider taking part in this great opportunity to serve Christ in our brothers and sisters! 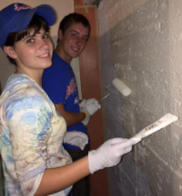 What: A week of service, prayer, and fun. All the information about the Catholic Heart Work Camp program can be found at their website here. Note that the Roanoke Camp is an "Original Camp" when looking up program details. Where: Roanoke, VA. Detailed information about home base, facilities, and work site can be found on the program web page. Who: All students entering 8th grade in the Fall of 2018 and older. What exactly will we be doing? During the days, you will be serving at a ministry site helping those in need. What ministry sites exactly are to be determined, and groups may rotate through several projects depending on the size of the project and the size of the group. The Roanoke camp describes their service as involving "a lot of home repairs, as well as work in food banks, assisted living and nursing facilities, daycare providers, and a few larger construction jobs." During the evenings, time will be divided between engaging in social activities with all the youth and engaging in prayer and reflection activities, including mass and confession. Cost: The full cost of the program is $345. A $50 deposit is needed to reserve a space in the program. Beyond that, we are asking families to contribute what they are able to the remaining balance, and the parish and our youth group fundraising efforts will subsidize the rest. All that said, please do not let the fee bar you from participating - if you are specifically concerned about the cost of the program, please contact me directly. How do I register? Call or e-mail Mr. Cottam to reserve a spot for you in the program. Our 15 camper spots will be assigned on a first come, first serve basis (with a slight preference being given to older students). Once your spot is saved, he will follow up with you about completing the registration paperwork and turning in your $50 deposit.